Chorrillos is a district of the Lima Province in Peru and part of the city of Lima. It gets its name from the Spanish word for "trickle of water". 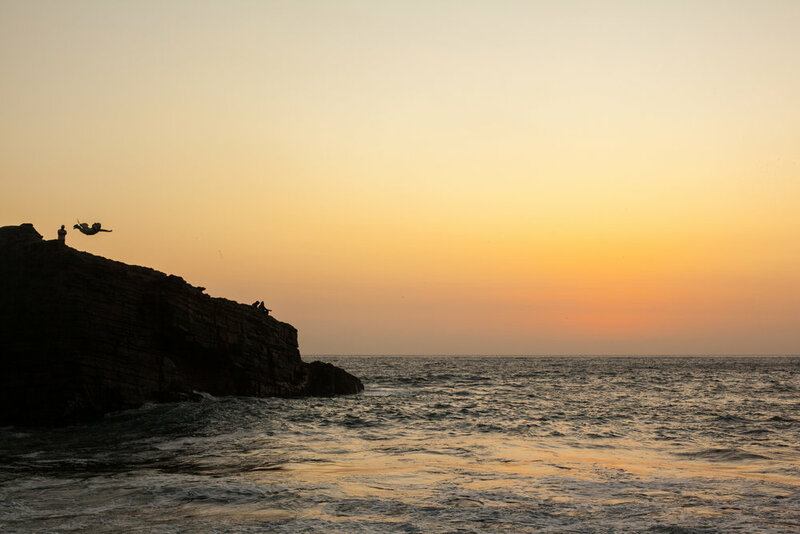 Chorillos is located next to Barranco on the coastline of Lima and has several different beach areas facing the pacific ocean. 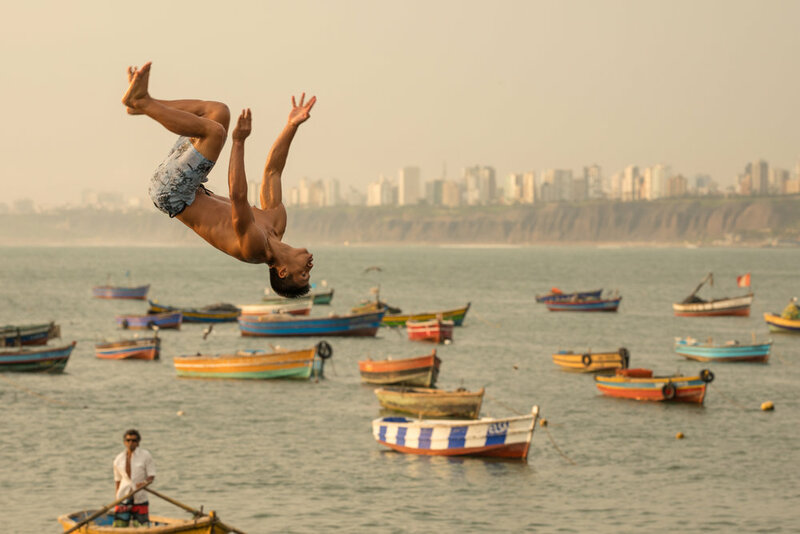 A boy backflips into the sea at Playa de Pescadores in Corillos, Lima, Peru. Surfers wait to enter the ocean during a bis swell at La Herraudra, Lima, Peru. A long exposure sunset photo of La Herradura beach in Chorillos, Lima, peru. A Monk dives into the water below at El Salto de Fraile, Chorillos, Lima, Peru. 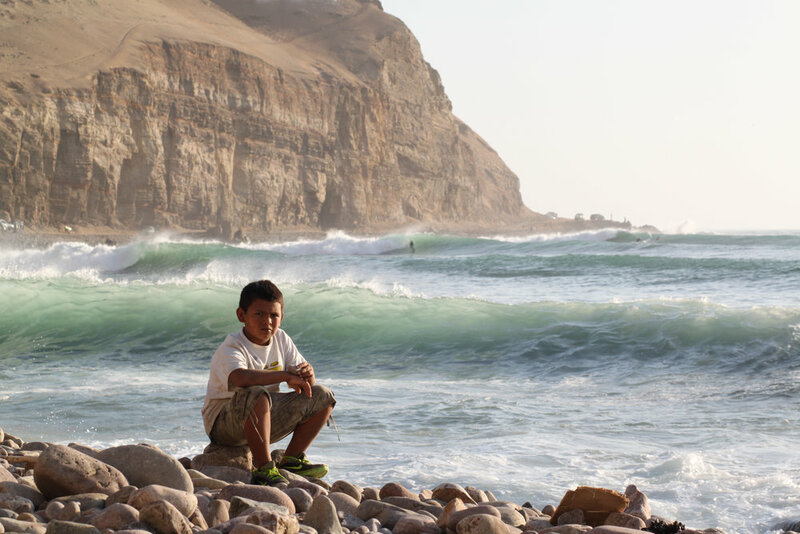 A boy sits on the shore of La Herradura, Lima, while waves are surfed in the distance. A man dressed as a monk dives into the ocean at sunset in Chorillos, Lima, Peru. 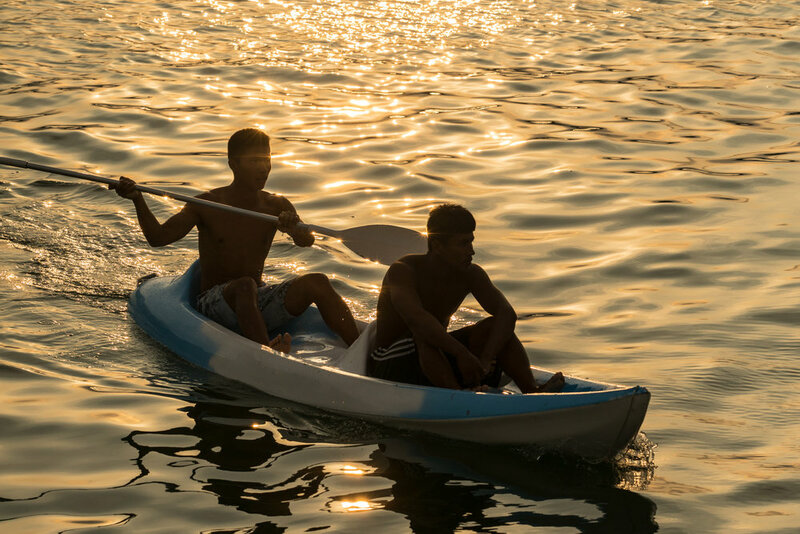 Kayakers paddle at sunset during the golden hour in Lima, Peru. High Flying Bird, birds taking flight at sunset in Chorillos, Peru. 'Playa de Pescadores', is a small fishing beach that is full of activity and a very interesting place to spend a few hours, people watch and enjoy the sunset. On the shoreline you can have fresh ceviche (Peru's national dish consisting of raw fish marinaded in fresh lime juice and chilli). On the small pier you can have a go at fishing for crab and small fish or take a boat tour around the local coastline of Chorillos and Lima. From this side of Chorrillos, you can enjoy a panoramic view of the bay of Lima taking in the views of Barranco, Miraflores and beyond. On a clear day, in the distance you can see La Punta and the San Lorenzo island in the district of Callao. Directly next to Playa de Pescadores is a private exclusive beach and sports club called Regatas. Regatas is one of the most exclusive sports clubs in Lima and attracts the rich and famous Peruvians who go there to exercise, sunbathe and relax. Around the headland you have the small secluded beach of La Herradura which was a deluxe beach resort in the 19th century. 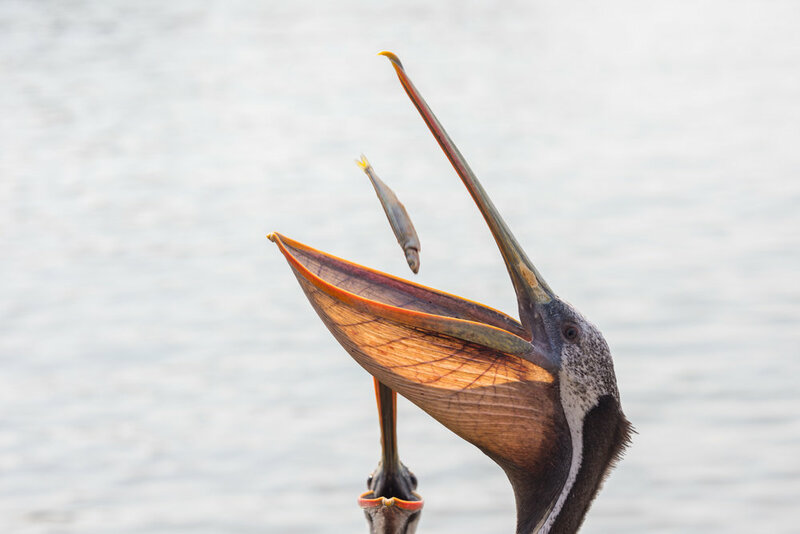 These days the seafront has several seafood restaurants where you can enjoy traditional Peruvian cuisine and watch the sun go down. The beach is also home to one of Lima's best surfing spots, La Herradura. The wave needs a big swell to work properly and has hosted several international surfing competitions. On the coastal road between the malecon of Chorillos and La Herradura you pass the rocky headland peninsula of El Salto de Fraile. Here lies an exclusive restaurant with the same name, and a legend of forbidden love that ended tragically. The tale involves young love which resulted in a pregnancy and the young man being sent to a convent for his sins and made into a friar. These days at the same spot you can watch locals reenact the tale. 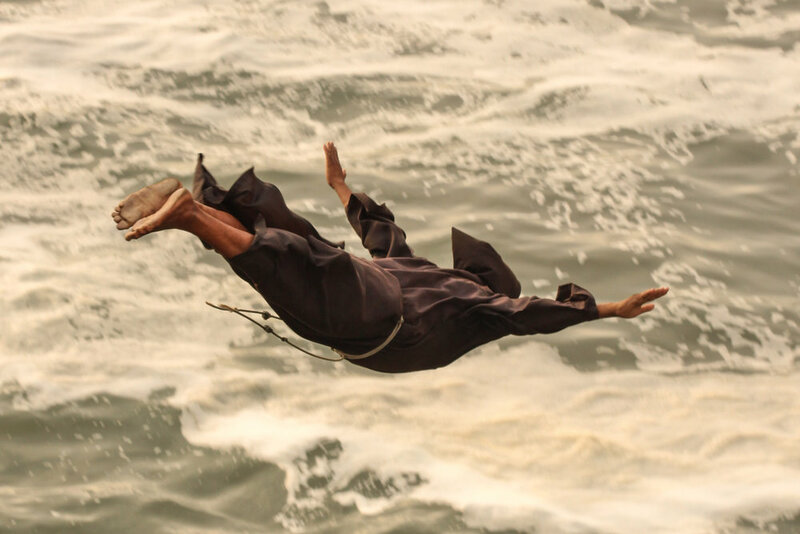 Men from the local Chorillos area dress as Monks and dive off the cliffs into the perilous ocean below. I have heard rumours that at least one person has died doing this dive. It’s a fascinating place however and I intend to return in the next few weeks to capture more of their dives. More of my Lima photography can be found on my website, my Instagram, and my Flickr account. If you are interested in purchasing any prints, using an image online or would like further information please send me an email at: geraintrowlandphotography@gmail.com.